Podium is perfect for any locally focused business with one or more locations relying on a local online listing to drive business growth or trying to manage multi-location reviews across the web. 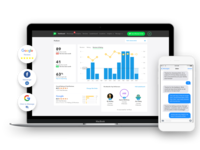 Podium is an Interaction Management platform that's redefining the modern relationship between local businesses and their customers. 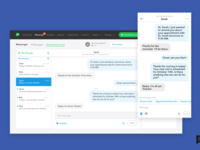 Recognized by Forbes as Cloud100 company, Podium makes it easy to manage all your customer messages Google, Facebook and inbound texts, from one dashboard. You can also generate more & manage all of your Google reviews, Facebook reviews and other sites to quickly reply to reviews, report on locations and understand customer sentiment. Pros: What I like most about Podium is the ability to add each representative so that they can send out invites to the customers they speak to. I like this feature because as a Marketing Specialist, I'm not on the phone with customers - they are. They can easily plug in their phone number or email address and the customer will receive the invite! They simply click the link and leave us a review. It makes it easy for not just the team, but the customers as well. That is very important to us. Cons: The inability to get access ALL analytical results on the dashboard. You get some of the info, but in order to look at everything, I have to generate different reports from the platform and look at it in a spreadsheet. This is probably the most annoying and inconvenient part of using this platform. It has the ability to filter and look at stats for some things and other things, its not there. Overall: Being able to easily track and report the teams stats on sending/collecting reviews. Easy platform for our team and our customers. Pros: In addition to being extremely easy to use and straightforward from a backend and frontend standpoint, this software is such an easy way to grow and manage our online reputation. I love that all I have to do (once my campaign is set up) is enter a phone number and hit "send"! It's way easier than asking our customers to leave reviews, and most of them actually do it. Cons: There wasn't much that I didn't like about the software. The only thing worth mentioning is there are a few creative limitations when setting up your campaign. However, nothing that a few tweaks couldn't fix! Overall: This has helped us immensely with capturing reviews as customers are leaving the store with their experience fresh in their minds! Pros: Direct Google integration is definitely the biggest pro here. They also are focused on having staff message customers directly for reviews one-on-one. It won't work for everyone, just depends on the business model. Cons: Very limited functionality and visibility into your account. Right now, it's basically just a review solicitation platform via messaging and email. It's efficient at getting star ratings and reviews, but that's about it. If you're looking for surveys, look elsewhere. Also, when I was a customer, they didn't even have NPS Score. That's pretty basic. Reporting is very limited and it's hard to get an overview of your total account, only individual locations. Customization is little to none for both the dashboard and the actual campaigns. Oh, and it's crazy expensive. You're basically paying for the direct Google integration. Which is super nice and important, but still. I also had a very negative experience that was unique to me. I had very specific contract conditions that were not met and it was a very difficult and painful process to get rectified. I felt very misled by the company and lost any trust I had in them. It was very disappointing. Pros: Probably the best thing about Podium are the SMS text feature that sends an easy to use FB or Google review link directly to a potential reviewer. The link eliminates any guesswork of confusion about how to leave a review which, for the clients we're using it for, would definitely hinder their customers from providing review. Additionally, the email notifications that inform any time a review is left is hugely beneficial because reviews never fall of your radar and because it's so so easy to respond directly to reviews within the Podium platform, it's simple and quick to just pop into the review and respond to it as soon as you're notified! Another thing I love is that Podium is constantly adding features and functionality, like the ability to now respond directly to FB reviews from the platform in addition to Google reviews. Overall: We've used Podium to quickly raise our client's Google review rating in just a short period- in less than 3 months, we've increased 1.2 stars and because responding to reviews is so easy, we've developed deeper relationships with reviewers with our responses. Pros: We used Podium through another company that we signed up with. We were able to easily text with customers and as for a review through this system. Our company is strong with customer reviews so it was an easier way to ask for one and the customer could access whichever review site they felt most comfortable with right from their phone. Cons: Some customers complain about leaving a Google review because they don't remember their Google login. This company helps with those customers because it gives them links to other review sites if they don't want to leave a Google review. Nothing in particular that I do not like about this product. Comments: I am at a new company and I suggest they use it too. Pros: People don't always have a gmail account. It made them jump through hoops to do a review elsewhere. People became cautious and leave the site. Cons: Nothing. I really did like using it. It was a great reminder to customers to do a review. It required almost immediate follow though. different goals for obtaining authentic reviews from happy customers. The Podium staff is amazing, on top of it, creative, helpful, knowledgeable, and always happy to help with enthusiasm. They always respond quickly to any questions. Loving Podium for the reviews! Pros: How it has helped us drive tons of positive reviews to our online profiles while also capturing negative feedback so we can act on it quickly and make things right. It integrates with Service Titan which is also wonderful. Cons: Reporting is spread across their site in a confusing manner until you get used to it. Overall: We love Podium and find a ton of value in using it to drive positive reviews. Pros: It does what it says it will do. Our reviews have more than tripled over the past year of working with Podium. 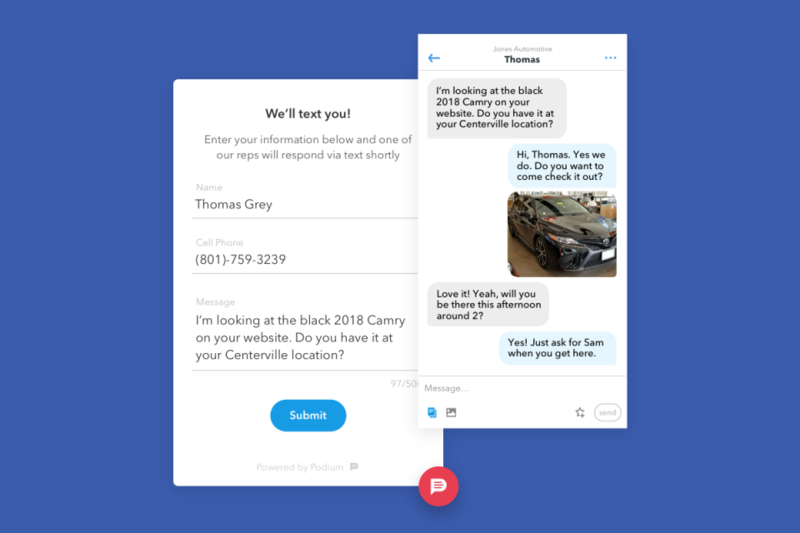 The platform allows an easy conversation with our customers and an easy way for them to tell the world what they think about our service. Because it is easy for our customers to follow through with the review, a high number of the requests result in reviews. 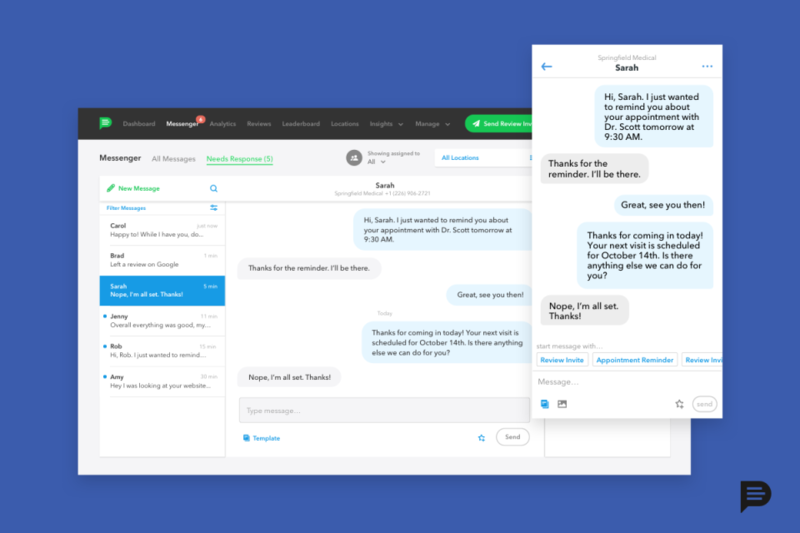 Pros: We signed up for Podium and it made messaging our patients super fast and easy. Any patients that have information that needs to be updated they can simply text us the information or a picture. Once we hit send, the patient receives it on the phone. Cons: At first the web log-in from a computer was limited to not sending images. Now you can send and receive images. Overall: Overall it has been great. The set-up was fairly fast and painless. The rep that explained to us what the program was did a great job. Pros: Podium is a top-notch company and I am so glad our company uses them. Their staff is outstanding and responds quickly and eagerly any time we have questions. Pros: Easy to use text messaging tool that allows you to request for your customers to review you. Often customers do not seek to leave a review their experience unless they were blown away positively or have a negative experience. This tool helps companies get ahead and proactively request for customers to review their experience. The system can be set up to manually set up to request for review or automated through an API when customers make their purchase. Cons: There are times that customers have had issues accessing the reviews after clicking on the link in the text message. Most are able to get there, but some have issues due to browser issues on their phone or computer. 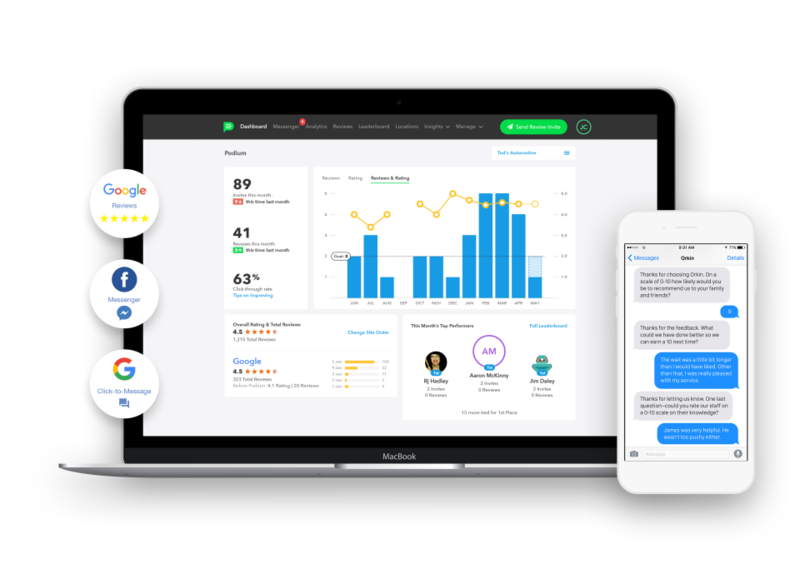 Overall: Ability to request for online reviews, track reviews for your company online, and track trends to see what customers are saying about your company. Pros: The additional reviews that my business received have helped us to reach a greater audience and had a great effect on our sales. The web chat functionality is excellent and allows us to stay connected. Cons: I have had occasional issues reaching customer service but nothing that would prevent me from using the software. Prepare yourself to accelerate your Google and other third-party reviews! Pros: It's focused so much on user experience. Both internal users and those leaving reviews are welcomed with an experience that helps drive results. There are other offerings that do similar things, but Podium is by far the most refined and feature packed. Overall: We have a hard time getting third party reviews because we have reviews we sent out internally to better understand where we may have fallen short throughout the customer buying life cycle. Through Podium, we are able to better leverage our crews to ask and facilitate the review process so that we can get feedback on these other platforms. Pros: Does a great job getting reviews and obtaining great information to build online reviews and reputation. Cons: The cost is very high. You get what you pay for, and podium does a LOT! Love the program just is costly. Podium was the first, but you pay for the name! Combines communication streams and reviews from Google, FB, and our website into one place. Cons: Price is a bit steep for SMB, but well worth it if you maximize the value of your positive reviews. Overall: Implementation was a breeze (thank you, Rep Team!). The platform is simple to use but powerful and full of value-adds. Pros: Effective Software program and works very Efficient with success you can see. The results can be measured as soon as the program starts. Good reporting. All Good have no problems or concerns at this time. The reporting and program is working as we were told that it would work with the results we were told . Podium is great to work with. They have helped us to get more positive feedback from our customers. Pros: Podium makes getting reviews from customers very easy. It only takes a second to send the text message to your customer with a link to submit a review. We also enjoy that we can send our customers texts from our work computer and no longer have to do it from our person phones which means everything is found in one place. Cons: We have a great experience using Podium. The only thing we could say that isn't positive is the initial set up was quite time consuming from all the long phone calls with different people. In reality it only took a couple of hours but when you only have a few employees that time is valuable. Other than that we love using podium! We are getting excellent results and achieved 70+ reviews in August alone! Great dashboard too! Pros: The user interface is easy to use and well designed. The messenger is helpful to achieve customer feedback and reach out to customer who have had a less than stellar experience. The analytics section is a useful tool for tracking and I like to check the competitive insights section to keep tabs on where we stand with the competition. Cons: I wish there was a way to encourage sales members to send out more review requests. We get most of our reviews from service when I know most of our sold customers would also submit good reviews if we simply requested them. Overall: Over 50 good reviews a month through automated service review requests and a useful dashboard. The best money we have spent in our marketing budget by far!!! Pros: The software is easy to use and implement in any type of business. By far the best software we have come across to generate reviews for our business. Cons: Software glitches. We had a malfunction once where the reviews were not being properly assigned to the person who sent the review. Great way to enhance your companies profile on both Google and Facebook. Pros: The format is easy to use and easy to set up. It makes it easy to have your customers leave a review and has enhanced our business. Pros: Tried out Podium for our restaurant and really enjoyed the experience. Lots of features for the money, allowed us to stay very organized with media. Cons: It's a great platform but we found it to be a little too expensive for our venue but still think its a very useful platform. Such a time saver for our business!!! Pros: Ease of use for us and our customers. We simply do not have the time to call or email each customer at the end of the day to request reviews. I also love that it is super easy for our customer so I don't feel like I am inconveniencing them with my request. Cons: I wish when it says I have already sent a customer a request that it would tell me if they left a review or just simply that I have already requested a review. That way I would know if I should send them one more request or just leave it alone. Rather than having to search reviews to see if they left one or not. absolutely boosted great reviews for my business! Podium can help increase your positive online reputation! Pros: Podium helps monitor and use customer feedback to increase positive reviews and enhance your reputation online. Cons: It can be hard to read and understand the results and how to improve your reputation -- but once you understand, it's easy to do! Easy to use software that makes getting reviews much easier! Pros: Very easy to use. I was also able to link it to my scheduling software so that the message gets automatically sent out each day. The new dashboard is great and much more helpful than the past. The link that is sent to customers could not be easier for them to follow. Cons: The competitive page was having some issues but looks like it is now working correctly. Other then that, no cons. Overall: Online reviews that are consistent and an automated way to send them out. This software saves me the time of not having to ask each customer to fill out a review and explain to them how to find my business online. Pros: Utilizing Podium as a tool to connect with our customers for reviews has been amazing! It's so great to know that we have Podium working for us to help connect with previous customers that we haven't been able to reach on that level! We've actually seen a lift in terms of word of mouth referrals ever since we started using Podium! Cons: While Podium does work very efficiently it does take time to set up the review accounts to capture these reviews. Once you plug in the accounts and get going it is amazing! Cons: Notifications can be slightly confusing. Overall: Been using Podium for almost a year now at my company. Makes it easy to hit review quotas. Pros: Did not use the service because I was lied to by the sales rep. Very disappointing to see a rep professing religious connections treat us this way. Beatiful, simple-to-use, software for reviews and feedback. Pros: The first thing you notice with Podium is all of the care taken to make it very user friendly and nice to look at. This just make it all the better to use, especially when compared with other similar products. The design is very well done with current online design trends. As for the functionality, Podium has allowed me to easily manage product reviews and feedback. With the many customizable options and features, this has made my life and job so much easier. I couldn't live without Podium now that I have it. Cons: Signing up was not the easiest. You couldn't even watch a demo or look at pricing without entering your information. I know sales needs to have a pipeline, but it was very off-putting, especially after looking at competitor sites with so much information available without submitting any information. Comments: The problem is that once you sign the contract, even if it is in the hallway at the Vegas Market, even if you thought Three-Forty-Five meant $3.45/month not $345/month, they are not letting you out of the contract. Period. There is no 3-month window where you can opt out if it's not for you unless you demand one up front. The messaging features are completely redundant to what we already had on various platforms. And if you want to research Podium, you really can't. There are no reviews allowed on their website. There are no Google reviews allowed. The only reviews you will find are on their FB page. Again, this company is all about MONEY. They want you to sign on the dotted line, and once you do, nothing will change their mind when it comes to the fact that the software is going to do NOTHING to increase business or up the number of reviews. ZERO reviews generated. If it were up to me, I would get all the software off our machines and platforms, change credit cards, and let them sue us. Pros: Absolutely nothing. It has been a giant ongoing pain to install. The hours my business partner has spent on the phone installing is ridiculous. Cons: Takes forever to install. The messaging icon is particularly annoying when I bring up our website on my mobile phone. New visitors are assaulted right off the bat with a bubble message exhorting them to write up, which takes up the bottom of the screen. You can't just swipe it off either. To close it, you have to hit the icon, which takes you to a separate page. If this happened to me on a website, I would leave immediately. Comments: Recommend to any store looking to build their online visibility! You can choose where to direct the customer to give the review such as Facebook or google. Works great! They also give you credit if you refer a business. Pros: Not only can you easily get tons of reviews for your store, you can also easily text customers anything you need to without getting a whole phone line. Cons: A little pricey but overall worth the money. Sometimes my customers say the link doesn't work, but most of the time it's fine. Podium is a company that can help drive positive change in your business, and the way your business works with its customer base. Pros: They were instrumental in helping us improve our brand trust, and increase our visibility on top review websites. There are a lot of simple ways to improve company and product image, most of which Podium will help you to take advantage of. Cons: Maybe an easier way to implement some of the strategies, they get the work done, but it can still take a lot of hours. Also better integration with social media would be an extra plus. Pros: Reputation management is very needed in any small business, and Podium has a variety of different review sites it integrates with. Cons: The customer service is not my favorite. I felt passed around person to person to try and solve an issues of mine. And then was just emailed a solution that really should have been delivered via a phone call. Overall: I've seen this tool work really, really well in local service provider's businesses. It's a *very* simple too. Which is great for a small business owners that isn't tech savvy. Pros: Easy for field and office staff to use. Great dashboard and data tracking. Messenger feature is great that allows to send text via the platform. Feel the value is definitely there. Cons: When we send the review link to the customer via text, sometimes the customer isn't logged in to google in the background so it doesn't always work as well as it can. Overall: More Google reviews. Texting platform. Tracking ability for reviews sent, received, and posted. Quick and easy to use software that gets results. Pros: Simple interface and app. Very user friendly for the end user. Very cost effective. Has improved the ratings we were looking to improve. Cons: Haven't found anything I don't like yet. The only area of support we've needed was to have a user's email removed from another organisation that he worked at previously to ours. Overall: We were looking to improve online ratings from Google for Business and Facebook. Results were immediate. Podium is linked in to our existing software and employees are prompted to ask for a review . Podium is easy to use and a huge benefit for our company. 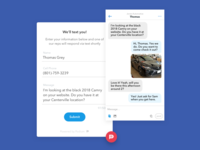 Pros: The personal connection we can have with our customer through the messenger rather than an automated response being sent out. Cons: I wish there were more options for customers to leave reviews. We have recently run into the problem where none of the options provided can be used by some of our senior customers that don't have a cell phone or email address. Overall: More reviews which means more customers. Pros: Ease of use, I do not know if it is possible to make the process of collecting reviews any simpler than this. Overall: More reviews along with an increased awareness for the company of the importance of customer service and marketing through word-of-mouth and web searches. Pros: Very easy to set up. My account was online in 2 days or less after I signed a one-year agreement. Staff is on top of follow up questions. Cons: Seems a bit expensive for what it is supposed to do. So far, I have not seen any reviews completed by my clients that I send requests for review through Podium. It has only been two weeks. Pros: Ease of use phone AP and the dashboard that is simple and easy way to see each employees invitations and responses and star rating! Cons: My only complaint is that the overall response rate from the public is poor especially if im after google reviews and they don't already have a google account which confirms the need to use software like this. Pros: Ease of use, increase google ratings, ability to send customers to review sites that you want. This allows adjustment to be done on the fly. Cons: Company is missing some keys features in regards to black listing, managerial settings, etc. Would be nice if the company sent out emails informing clients about updates to their software/website. We have received a great response form our customer base! Pros: My favorite thing about the software is being able to manage everything on the desktop and forward messages to our service technicians. Cons: If I had to pick one thing I liked least I would say it is the cost. However, we are a new client and this opinion may change. Overall: The company I work for is getting a great online appearance! Making matching estimates a thing of the past! Pros: Love the fact that my writers can write repair plans and have someone else match field estimates. Much more productive TEAM when we utilize Estify. The repair process starts with a matched estimate. Overall: Numerous but the main attraction is that it keeps the writers writing and someone else doing the matching. Great product for the money. Pros: very easy to use on both the user side and customer side. Very professional feel to the customer. Increased the amount of reviews we received. Cons: needs a few extras to make it worth the money, like a facebook post generator. a database of post and suggestions based on holidays, promotions, life hacks, ect. Incredidivly simple interface and very user friendly. Pros: It makes it easy and fast for the customer to leave reviews. It also is a great and attractive platform to manage reciews. Cons: Yet to find anything I dont like but I think that the option of selecting a certain message for each review or second invite would be great! Overall: The easy ability of earing more reciews!